Click on 'Edit' in the upper toolbar. Click on the 'Redact' option. Choose the way to hide content: 'Blackout' or 'Erase'. Drag over and select the fragment of text you want to hide. PDFs make for a great way to share documents with your colleagues, co-workers or friends. Companies commonly use PDFs to share text-based data such as reports, agreements, research, etc. and you’ll also find PDFs commonly used for bank or credit card statements, mutual fund reports, credit score ratings, etc. Most of the data contained in these type of documents is confidential and/or sensitive. You have to be very careful who you share these documents with, and it is recommend to password protect PDF documents for added security. In Edit mode, click on the 'Redact' button. Select the fragment of text you want to redact in PDF. There are two available options: blackout or erase. However, many a times, you’ll find yourself in a situation wherein you have to share certain information contained these documents with others. For example, you may need to share your bank statement with your loan issuer, or you may need to share your rent agreement with a friend for the format, without revealing sensitive data contained in it. Are you trying to figure out how to redact a PDF in order to either permanently delete sensitive data or to black out or hide confidential text in your documents? Leave it to PDF Expert to get the job done! Our PDF redaction tool for Mac is extremely useful when you need to hide your residential address, social security data, credit card numbers, or any other kind of information in any kind of PDF documents. Click on the 'Search' icon at the right sidebar. Type the word you want to hide in the 'Find and Redact' field. Select a search result and click 'Redact' or click 'All' to hide items. The 'Done' button is the final step. Voila! 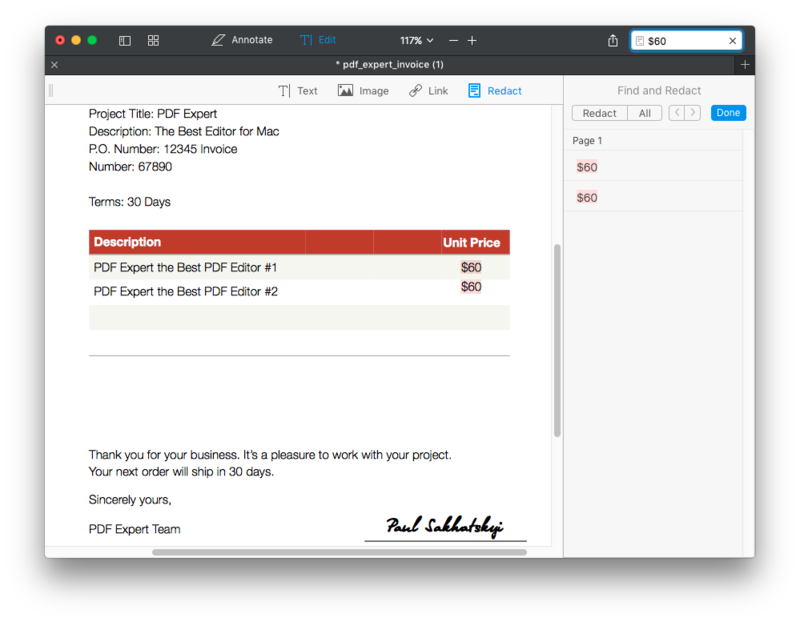 PDF Expert just saved you a ton of time. So, if you're looking for a way to redact a PDF on Mac, PDF Expert offers the best PDF redaction tool on the platform and allows you to easily hide sensitive content from your documents, and includes many other features to make your work easy. We welcome you to get a free 7 day trial and check PDF Expert out. And if you have any questions, help is just a click away.